We live in a busy world that is changing at the speed of light. Yet, good manners never go out of style. Most of us parents emphasize the importance of please, thank you, and excuse me, and do our best to insure that our children are polite, but when it comes to the finer points of etiquette, many of us could use a kid-friendly guide to help the cause. Soup Should Be Seen, Not Heard by etiquette expert Beth Brainerd is that guide. Originally published in 1990, it has been updated in a new edition for the 21st century and recently received a Mom’s Choice Award. If you think your children would roll their eyes if you handed them a book on manners, think again. 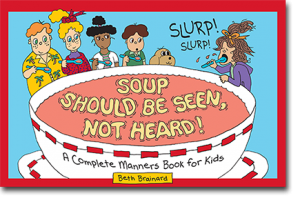 Soup Should Be Seen, Not Heard features charming illustrations and a great sense of humor that will have them laughing as they learn. It offers advice children can actually use in their everyday lives, both today and as they grow into adults. This is a very useful book and both children and adults will appreciate the value of it. It offers the answers to questions such as how to set the table, introduce people, use the phone correctly (and when to turn a cell phone off), and what to wear to a party. Even as a well-mannered adult, I picked up some tips from reading this book. The overall message is to treat people well and with kindness, utilizing the golden rule. This is much more important than using the proper fork, although that information is included as well. Soup Should Be Seen, Not Heard also comes with some free extras for parents and teachers. An online companion called Why? provides information that helps further explain the reasons behind what might appear to kids to be arbitrary rules, like passing the salt and pepper shakers together. It also offers additional helpful tips such as topics to start a conversation, cell-phone etiquette, why one needs to dress appropriately for an occasion, and rules for being polite in a public place. A set of lesson plans, prepared in conjunction with professional educators, is available to teachers who wish to use this book in the classroom. It can be requested at http://www.goodideakids.com/foreducators/. The world could certainly use more politeness and common courtesy. Teaching our children (and perhaps taking a refresher course ourselves) is a great place to start. Soup Should Be Seen, Not Heard will help you do just that. Previous ArticleSabotaging the Medjugorje Commission?